An important way to think about functions for Common Core math is as relationships between variables. If you think of a function as a relationship, you can keep an eye out for useful features. These features include whether (and where) a function is increasing or decreasing, whether a function is linear or not, and so on. You can read a graph from left to right. If the graph rises as you read from left to right, it means that the y-values are increasing. If the graph falls as you read from left to right, the y-values are decreasing. If the graph is horizontal, the y-values are constant. A function can be increasing for all x-values (such as the line y = 2x + 2), or it can be increasing in some places and decreasing in other places (such as y = x2 + 2). In eighth grade, students may simply describe the change they see in graphs of functions, and often these functions don’t have symbolic form. This graph describes Jim’s distance from home as a function of the number of hours since he woke up on Tuesday. Tell the story of Jim’s day, accounting for all of the information you see in the graph. Be sure to include reasons for the increasing, decreasing, and constant values you see. 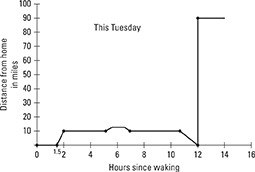 For example, the graph is constant at zero for the first part of Jim’s day because he woke up at home and left for work an hour and a half later. The graph increases to show his commute to work, where he stayed until lunch. He walked to lunch in the middle of the day (notice that the increase in distance from home shows a lesser rate than during his drive to work). He drove home at the end of the day before leaving on a trip. He spent that night at a hotel 100 miles from home.